Today has been a day of bizarre food. First, I was happy that I didn’t invite guests over for dinner. 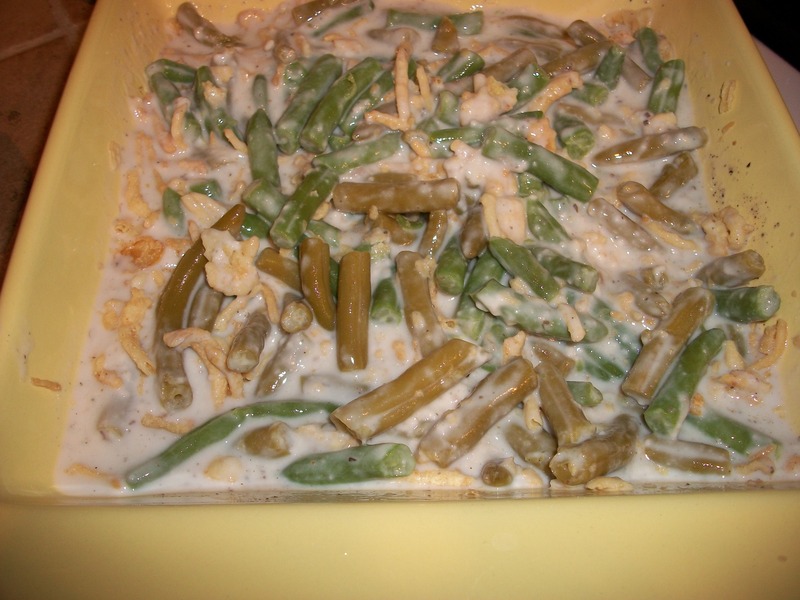 Dinner itself was delicious — some ham and green bean casserole, but look at this mutant casserole. See how the beans are two very different colors? I was using two different brands of green beans, and one of them had an additive to help the veggies keep their color. There was no effect on the taste, but I do recommend buying the same brand of green beans if you ever serve this casserole to company. The second food event was exponentially more bizarre. I wanted to take a picture, but I missed my chance. This food event actually spans two days…yes, two whole days. Last night, I was scared spitless when I put Deogi outside for the last time. He’ll scratch at the back door if I leave him out longer than he wants to be out, but last night, it sounded like he was trying to climb the side of the house. Given all the critter troubles I’ve had, I was preparing myself for the worse. For all I knew, he was trying to climb the wall Matrix stunt style to fight a possum, bat, or maimed, rabid squirrel. I’ve definitely seen all three creatures in the backyard. Ok, the squirrel wasn’t maimed or rabid, but it did chew holes in my lawn furniture. My heart was beating at the tempo of techno music, and I wanted to save Deogi from being attacked, but I was terrified that the possum was hunkered down behind the recycle bin waiting to dart through the open door or that the rabid squirrel was somehow clinging to the side of the house ready to dash in. Finally, after unsuccessfully trying to flip off the kitchen lights to peer outside and see what was going on, I went to the door and said, “Deogi, be ready to move quick.” Clearly, I was not being rational; sharing my plan to open the door quickly was not going to help the situation. Just about the only English words that Deogi knows are “want to go potty,” “park,” “NO!” “let’s go home,” and “it’s on TV.” The last phrase gets busted out when he barks incessantly at doorbells ringing on tv, and actually, I don’t think we can count those as words he knows because he keeps barking. Anyway, I got him in without having any creatures come in with him, but given that my fear level was at an 11 on a scale of 10, I decided to investigate the situation in the morning. This morning, I discovered that all the ruckus from last night was Deogi trying to stretch up to the kitchen windowsill to eat a slab of meat. Yeah, that’s right. A slab of meat. What looked like a marinated slice of roast beef was just lying on the windowsill. I was glad that there was no rabid squirrel curled up in a ball and foaming at the mouth, but I was grossed out and thinking about how I would have to get home from work, put on some latex gloves, and then layer two groceries bags to clean up the meat. However, by the time I got home, the meat was gone.So, there is no picture to document the event. You’ll have to take my word for it. This entry was posted in a little bit of humor, that's life, Uncategorized. Bookmark the permalink.